I was looking at the basket were I keep all my new seasonal nail polishes, and it's time to swap out last season's polishes for this fall's new acquisitions. And, what did I find at the bottom of the basket? 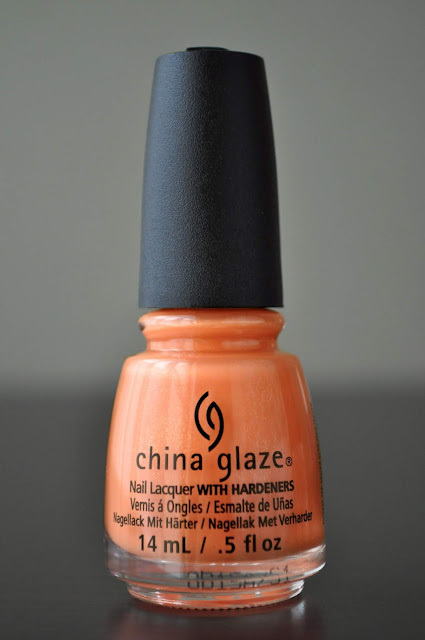 China Glaze's All Sun & Games. I want to do posts on all the shades I love for Autumn. But, before I do, I need to get this polish out of the way, and my life. The sole purpose of me writing about All Sun & Games is to have written documentation of my dislike for it, just in case my memory gets hazy with time. All Sun & Games is a bright sherbet orange, with gold shimmer, and a matte finish. First, let's talk about the shade. Try as I might, I've come to the conclusion that these shades of orange do not look good against my skin tone. The application was terrible. Each layer was plagued with uneven bald spots, and took a total of 4 or 5 coats (I lost count) to correct. Generally, I dislike matte polishes; their chalky texture and finish makes my skin crawl. However, matte finishes have improved over the years, and I find myself enjoying them more and more...but not this one. In conclusion, All Sun & Games is one polish that will not be going into the nail polish cabinets. I have thought about giving it to a friend. However, I would like to maintain that friendship, and will be disposing of this polish in the trash bin. Really? I think it's the opposite. A lot of the recent polishes have practically been one coaters. Which polishes are you referring to? 15 days left in the What's In The Box? Giveaway!